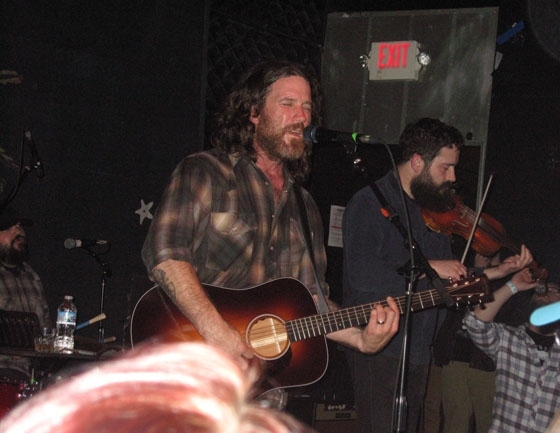 It had been many a year since I’d seen Chuck Ragan perform, and that was with his former (and sometimes current) group Hot Water Music. I’d never seen the man play solo live, but I know his history well. Not as a super fan, of which HWM alumni have plenty, but as a casual fan. 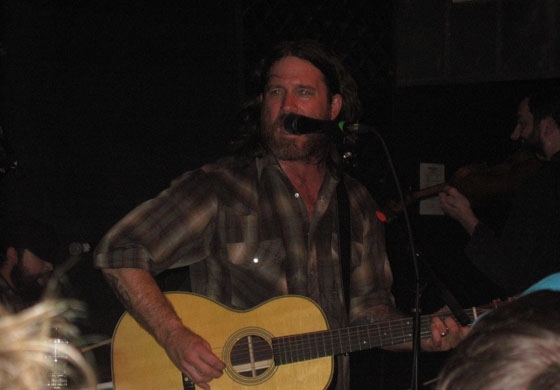 It took two things for me to really appreciate Chuck Ragan. The first was seeing The Draft and not being impressed. For those uninitiated, the Draft is essentially Hot Water Music minus Ragan. The second was his 2011 record, Covering Ground. Till Midnight (2014) is solid too (and a review is forthcoming), but it was that record that won me over again. Pulling up to Triple Rock the crowd was already bleeding into the street and there was a SOLD OUT sign on the door. Pushing my way inside, I realized that the crowd was very different from previous Ragan endeavors. Had he grown a new following outside of punkrockdom, or was it a case of a split bill with White Buffalo? Let’s just say that while White Buffalo weren’t bad at what they do, it didn’t appeal to me and I mostly sat their round out, away from the sweaty crowd. As they finished their middle of the line-up set, the place didn’t exactly clear out, but it became easier to move about the venue and it would be a safe statement to estimate that perhaps a quarter of the crowd left before Ragan’s set even started. He took it in stride, acknowledging his past affiliations with the venue and its staff, and jumping straight into his singer-songwriter/folk blend. Ragan plays with a full backing band, The Comraderie, and while they fill out the sound and offer some harmonies, it’s still clearly his music onstage. He is rightly in the spotlight, but he also didn’t interact much with his cohorts, instead playing one song after another with a few asides directed to the crowd. Those comments were mostly about the music and the club, but he wasn’t much of a talker. What sets Ragan apart has always been his unbridled enthusiasm. His heart comes across clearly, as my companion at the show and I recalled seeing him play with Hot Water Music in 1999 (?) with a broken foot and still stealing the show, regardless of playing his guitar from a folding chair for that whole set. His songwriting is strong and his voice and performance skills are effective, but it’s his stage presence that defines his music. When Ragan sings, he means it. There’s no arguing the conviction as his neck veins coarse and his eyes close while he belts out the words and that ragged voice—which sounds like it should be ruined from all these years in basements and clubs—has actually become more fluid and nuanced than ever. He’s honed his voice and for all the “gravel,” it’s clear that he’s a professional singer capable of hitting his notes without damaging this throat for the rest of the tour. The set was a mix of his catalog, from the early Blueprint Sessions up to the new Till Midnight, with Till Midnight probably carrying around 50% of the set. The crowd was into it all and there was a smooth transition back and forth through his catalog. Then, after a full night that pushed an hour onstage, he took a breather, came back out, and announced that the next few songs would be from his other band. (Contrary to one audience members demands, those were from Hot Water Music, not Rumbleseat.) Here, the night took a turn toward shouted vocals that were mostly overshadowed by the crowd anyway. These songs were singalongs for the diehards, and they got their money’s worth out of it. Speaking as the “casual fan,” it was a good show and an even better performance. I’d expected a bit more of the punk vibe that often translates to more-talk-less-rock, but Ragan was to the point and “professional” all night. Meanwhile, his songs never waved, clearly tightly rehearsed but still personal in meaning to him, it hit on both elements. I was a bit surprised there wasn’t more interaction with The Camraderie, but it didn’t lessen the show—it just maintained who the crowd was really there to see and whose name is on that album cover. Compared with his previous band, the atmosphere was definitely different, with a more “positive vibe” tone than the high octane, louder Hot Water Music shows. Ragan himself looked a bit more thin than I remembered, dawning a flannel shirt and long, somewhat curled hair—something of an Eddie Vedder look from a distance or through a blurry photograph. The crowd was a mix of punks and craft beer drinkers.